Since its launch in 1996, Reef Endeavour has been a popular vessel with a legion of fans -- mostly Australian passengers who've taken cruises in Australian and Fijian waters. The ship spent its first 15 years deployed to Australia's Great Barrier Reef, but, in 2010, Reef Endeavour was moved to Fiji to replace Captain Cook Cruises' Reef Escape, which had been damaged in a cyclone. Today, the ship looks smart after a 2013 refurbishment. Ship upgrades came following the devastating Cyclone Evan that struck Fiji's west coast in December 2012. While at anchor in Nadi Bay (west of Nadi Airport) and with no passengers onboard, huge waves pounded the vessel, smashing windows in the dining room, flooding cabins and damaging the top-level Sun Deck. The five deck ship was repaired and refreshed, with new carpets in all cabins and public areas (including all-weather turf on the Sun Deck), new outdoor furniture, new indoor lounge and dining room furniture and a new glass-bottom boat and tender. Soft furnishings also were added to the cocktail lounge, while all cabins were refreshed with new bed linen. There is also a small fleet of new yellow kayaks. A trip on any of Reef Endeavour's itineraries (to the Yasawa Islands or the more remote islands around Vanua Levu to the north, or the Lau group and Kadavu to the east and south, respectively) is about swimming, snorkeling and meeting Fijians in their village settings -- at church services, in markets and in small towns. Much of the time is spent on land -- or, more correctly, in the water -- and the ship makes for a very comfortable and friendly base. The all-white Reef Endeavour has a classic-ship profile and cuts an attractive figure in the water; its whiteness broken up by the walnut polished timber of its cabin doors and railings. Built to handle the outdoors -- and the often-wet weather of the tropics -- most cabins are accessed via the open decks that run along the sides of the three upper decks. There are no balconies, as passengers (except those on D Deck) step straight out of their staterooms or suites onto these three-foot wide decks and take in the glorious views. The small ship, with its handful of public rooms, provides the perfect blend of bonhomie and intimacy. Passengers easily find little nooks to sit alone and read books or snooze. As most water sports take place off the ship, the pool is goes unused for long periods (except when there are children onboard), and there are always plenty of loungers available. Once the ice breaks, usually by the second or third day of the cruise, the camaraderie is wonderful, helped along by the ultra-friendly crew and the twice-a-day disembarkation into small boats, where it's always possible to talk to a fellow passenger or two. While the ship can carry 130 passengers, it often cruises with just half this number. Most cruisers know the crewmembers by name within no time. That's because the boatswain, for instance, might also be serving drinks at the bar one night or singing a few songs around the piano in the evening. It's a happy, feel-good way to spend a few days at sea. Reef Endeavour caters to everyone, including children older than 5. The itinerary often determines the age group, with younger passengers (families and those in their 20s and 30s) on the shorter three- and four-night trips to the nearby Mamanuca Islands and southern Yasawa Islands and mostly older passengers -- 50+, but with sprinklings of younger folks and even a few kids -- on the seven-day Four Cultures Discovery and Colonial Fiji Discovery cruises that venture to the more remote islands. The seven-day Yasawa Islands cruises are a combination of the three- and four-nighters (with some people staying onboard for both), so these cruises tend to attract a younger clientele, as well. An 11-night Lau & Kadavu Discovery Cruise attracts older well-traveled passengers. These islands (to the east and south of the main island) are very much off the beaten track, with several that had never been visited by a cruise ship before. About 80 percent of passengers are from Australia and New Zealand; others are from Canada, the United States, Germany, Austria, Switzerland, France and occasionally Holland. Europeans tend to cruise during the northern hemisphere's colder months, from November to April, although this is the rainy season in Fiji. All menus and itineraries are in English. Onboard attire is smart casual, leaning a bit more toward casual. The Captain's Dinner is held on embarkation night, and passengers are asked to dress up. In Fiji, this means long trousers and a polo shirt for men and a cocktail outfit for women. The rest of the cruise is smart casual, meaning evening clothes can include shorts and sandals (for both men and women) and casual dresses. Most women tend to wear sun dresses or light pants with nice tops to dinner. Men are not allowed to wear tank tops (sleeveless T-shirts) in the dining room in the evening; swimsuits are not allowed in the dining room or Yasawa Lounge at any time, and shoes must be worn in the dining room. Each cruise has an island night, and both men and women are encouraged to wear sulus (sarongs) or tropical attire, including Bula shirts (Hawaiian shirts). As passengers spend a good deal of time in the blistering sun, a hat and sunscreen is essential while a "rashie" (or rash guard, a swimming shirt that prevents sunburn) or T-shirt should be worn when snorkeling. Reef shoes or plastic sandals are a must when walking on the coral-strewn beaches. Modest dress is required when visiting villages for concerts, feasts and church services or when walking around the towns. Passengers can cover their legs with a sarong, or wear lightweight long trousers, long shorts or below-the-knee dresses; they should also cover up bare shoulders. Hats and baseball caps should not be worn in villages. The onboard currency is the Fijian dollar (FJD). Tipping is not expected in Fiji. However, it's customary for the crew to share whatever tips are given. There is a communal tipping box at the purser's desk, where passengers can place tips at the end of each cruise. 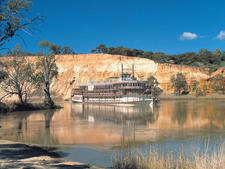 The PS Murray Princess is the largest paddle wheeler (also called a stern wheeler) in the southern hemisphere, offering an authentic cruise experience on South Australia's Murray River.